You are currently browsing the tag archive for the ‘Beads’ tag. My Craftsy.com Class about to Launch! Monday, May 18th! 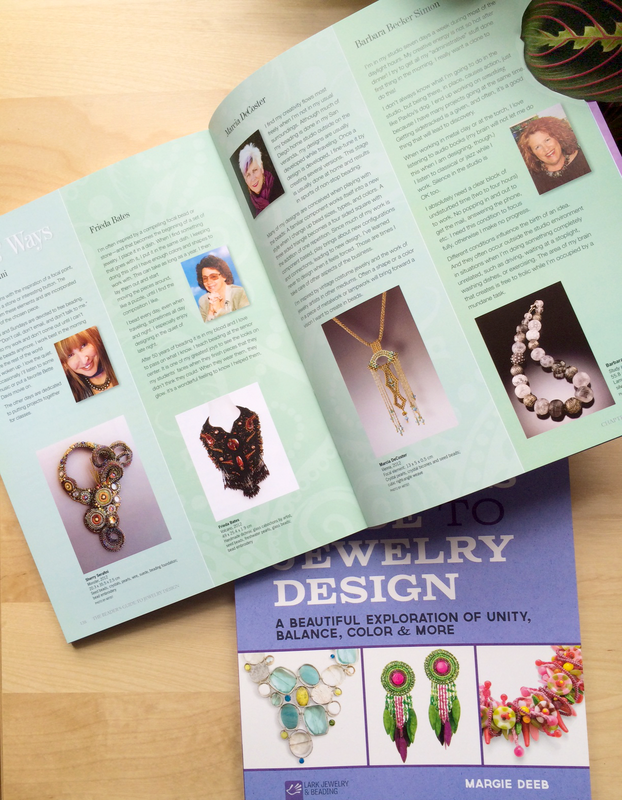 Stay tuned, jewelry designers! You’ll be able to learn how to create more unity in your designs, how to design for customers you know, and those you’ve never met, how to design for specific body types, and so much more! I’ll also be giving away a free class! 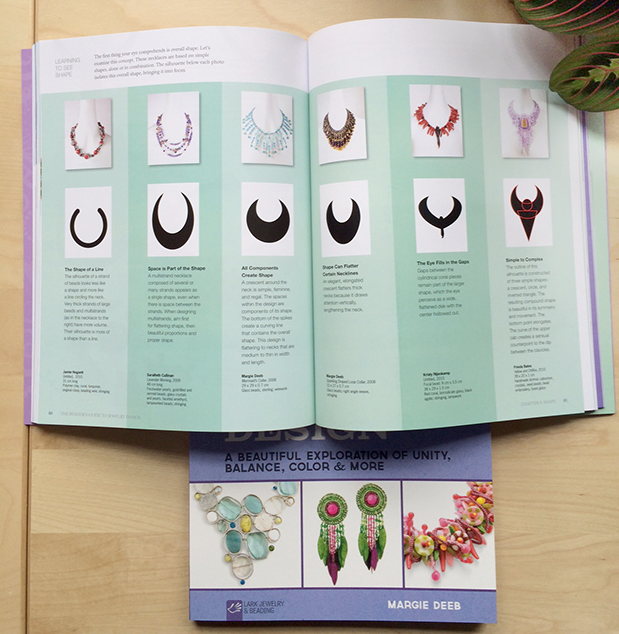 Two advance copies of my latest book, The Beader’s Guide to Jewelry Design have arrived. I’m so pleased with the content, the paper, the quality of printing, the photography. I am VERY PROUD! And so excited for you to read it, dear artists! 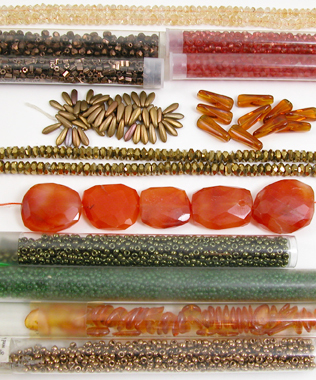 Its time to pull out the gorgeous, rich, autumn colored in gemstones and glass beads. Shades of honey and amber, russet and pumpkin, wine and maroon, hunter and forest green. And every shade of brown imaginable, from chocolate to black coffee. In gemstones, make sure you include jaspers & agates, citrine, carnelian, African brown rhyolite, hematite, obsidian, aventurine, malachite, olivine, tourmaline, serpentine, jasper, unakite. And of course, the must-have metals of the season: copper, bronze, silver, gold. Metals are essential to this earth-based season. 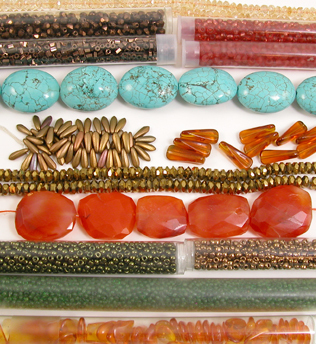 Autumn-inspired beadwork should give off a burnished glow, so weave radiant gold and/or warm bronze into every palette. The sheen of copper beautifully augments autumnal greens and blues. But wait… there’s an important color missing. A color everyone overlooks in this season that can make any autumn palette absolutely divine… turquoise! Yes, turquoise, that hue somewhere between blue and green, and slightly darkened (especially the color of the stone itself, with its charcoal grey matrix). Those with winter leanings (lovers of high contrast and saturation such as myself) love a pure turquoise. Those of the spring season love it pure and bright. Those of summer like turquoise gently tinted. And those of the autumn season love it in any variation. So don’t forget the turquoise – the stone of the color – in your autumn creations. It will heighten the drama, the contrast, and the beauty of your beadwork. ... the addition of turquoise makes them divine! So don’t forget the turquoise – the stone or the color – in your autumn creations. 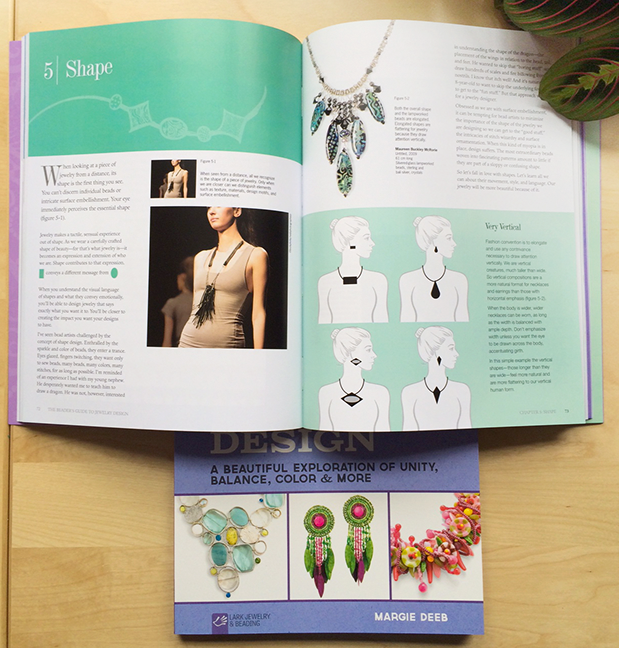 It will heighten the drama, the contrast, and the beauty of your beadwork. “NEW YORK (Reuters) – Designers at New York Fashion Week are betting on accessories such as belts, boots, jewelry and even a pearl-studded scrunchy to tempt shoppers during the recession. It is not just that accessories are a more affordable way for consumers to make a fashion statement, some buyers can also be enticed by one-off investment pieces — as long as they are unique, experts at New York Fashion Week said. Accessories sales have held up better than clothing in the worst recession in some 70 years and according to market research company NPD Group they are poised to be one of the earliest fashion areas to recover. Bold belts, necklaces and bracelets featured prominently on New York Fashion Week runways as designers show collections for spring and summer 2010 and one of the most talked about pieces in Marc Jacob’s collection was a pearl-studded hair scrunchy. “Many stores that focused on clothing are opening up to having bigger displays or bigger buys for accessories and shrinking their buys for clothing. You’re just seeing a different kind of market right now and I think designers are recognizing that,” said Jodie Snyder, whose DANNIJO jewelry partners with designers such as Carlos Campos and Bensoni. Luxury brand Henri Bendel has stopped selling clothes at its flagship Fifth Avenue boutique to focus on accessories, gifts and beauty products. Australian designer Anna Coroneo scaled back her collection of dresses this year but is rapidly expanding her accessories offerings. Her key accessory — silk beads — has been popular with consumers worldwide and she is now working on a scarf collection based on her own artwork. “Accessories are really important right now,” designer Jill Stuart told Reuters backstage after her runway show, which featured fishnet boots and sparkly belts. Belts played a key role in a number of collections, coming in a variety of widths and textures including on evening gowns and high-waist swimsuits. In the first half of 2009 belt sales performed significantly better than other accessories, rising 32 percent compared to a year earlier, according to NPD Group data. The economy has forced designers to become more attuned to what the consumer is looking for and give them a compelling reason to buy, experts said. In the past decade “consumers were afraid of missing out on the next big thing. Now that the paradigm has shifted, consumers are king again and they are pushing back. They are much more discerning in their purchases,” Ann Watson, a fashion retail consultant, told Reuters as she sat in the audience of Brazilian designer Carlos Miele’s show.